The Dos and Don’ts of Decorating Your Child’s Bedroom: How to make it fun AND great for sleep! 2) The child’s room is so void of any element of distraction that it seems more like a hotel guest room than a nursery or toddler bedroom. Neither extreme is necessary, nor particularly helpful to sleep. 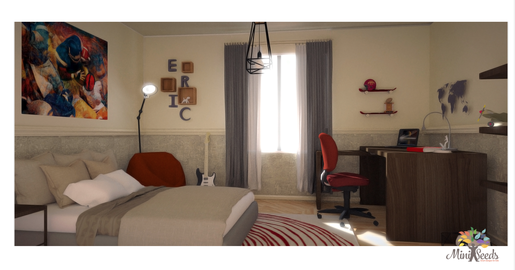 So, in today’s blog, let’s talk about the basics of your child’s room environment, and find a balance between a room that is WAY to distracting for proper sleep, and one that is still fun and inviting for your little one. 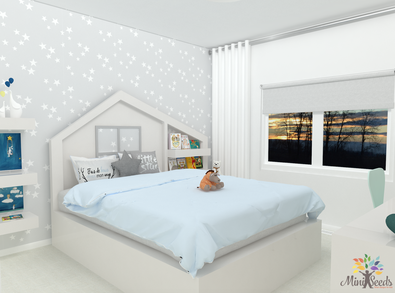 To do this, I’ve teamed up with Nevine from MiniSeeds.com - an amazing company devoted to creative interiors for kids - to get expert advice on colour, layout, and fun in your child’s sleep space! Keep out bright light – either bright sunlight or artificial light such as street lamps - with blackout blinds and curtains. 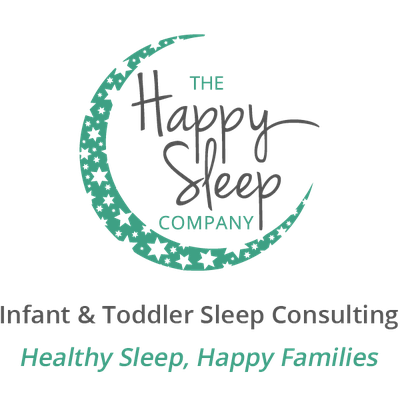 If you live on a busy street, have a loud pet, or perhaps an older child making a lot of noise when your baby is trying to nap, white noise can be very helpful. When using a sound machine or app on your phone, ensure you use only a “white noise” setting (no ocean waves or jungle sounds, which can be very stimulating), and run it continuously (not on a timer) to keep your baby from waking at loud noises. While it’s fine to have books and some toys in your child’s room, try to avoid dumping the entirety of the toy store’s doll aisle into the space where your kiddo sleeps. This will be very distracting, and not conducive to sleep. If you DO have another space for toys in your home (e.g. a playroom or nook where these things are kept), aim to keep the majority of toys there and only a small number of quiet items in your child’s room (think stuffed animal vs. siren-wailing toy police car). If you DO NOT have another space for toys in your home and your child’s bedroom is also her main play space, ensure you set it up with designated “corners” for particular toys and games, and also have lots of creative “hiding spots” for all of the various items, so that you can make it clear that when sleep time arrives, the toys go away. 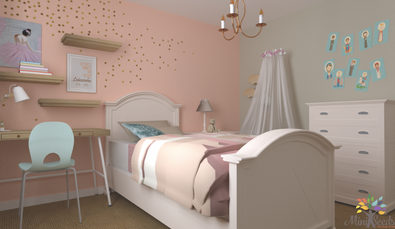 When decorating a new space, I carefully try to learn more about the feel my clients want to create in the child’s room and, from there, select a colour theme that is both beautiful and trendy. Because , colour is a non-verbal way of communication that can instantly set a mood or create an emotion and push people to take a certain action. This is crucial to keep in mind when you are choosing a colour palette for the space in which kids will be spending their time. 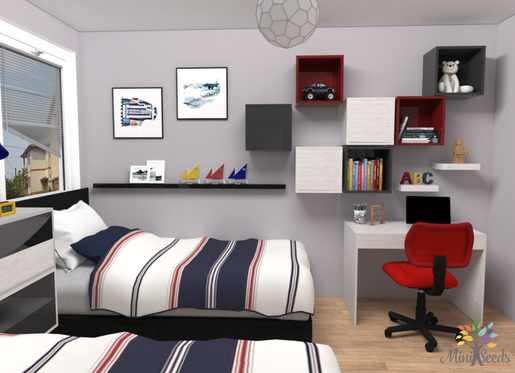 Also, choosing a colour scheme for a bedroom where a child will only be sleeping is totally different than a colour scheme chosen for a room where kids will be playing, reading, or exercising! What are the psychological effects for the colours of the rainbow? And, how they translate in kids rooms? Red: Rich, elegant , mature , expensive , tasty, spontaneous and creates Drama , Power, warmth. Pink: Positive, exciting , playful, attention getting, hight energy, vibrant, stimulating. Coral: Delicious, fruity, sweet, inviting, intimate, warm. Brown: Just like chocolate , delicious, rich , appetizing. but also : caution, negative, hazard. Green: Calm, neutral, quiet, fresh , youthful. Aqua: Water, cleansing, fresh, baby, cool ,dreamy, soft. Orange: Vital, Juicy, Fruitful, Friendly , Optimistic, sociable, persuasive , Happy , child like. Blue : Calming, cool ,heavenly, quiet , peaceful, clean, patient. Purple: Positive, sentimental, thoughtful, protective. What emotions does your kid’s room promote?! Nevine is the founder of MiniSeeds.com. She works with parents and children to create a space for them as unique as they are. Check out her work at https://www.facebook.com/miniseedsclub/.